FOOTBALL: WESTFIELD produced what was almost a season-defining comeback as they completed the double over Guildford City last Saturday. 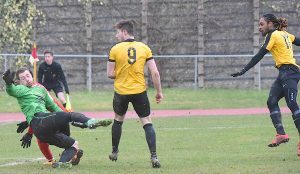 A defiant Yellows’ side were rewarded for their tenacity in the second half, scoring two goals in the final 10 minutes to beat their local rivals 4-2 and extend their lead at the top of the Premier Division. With Westfield having not played since 24 February, boss Tony Reid was hoping his side hadn’t forgotten how to finish. So to help bolster their ranks, Reid brought Kyle Bailey and Karle Carder-Andrews back into the starting XI for the short trip to Guildford Spectrum.